The following is part of a series. Please also see Top Stories 2017: Navy Acquisition, International Acquisition, Marine Corps Operations, Marine Corps and Coast Guard Acquisition, International Operations and New Administration. In 2017, the Navy and Marine Corps were active in nearly every corner of the globe. Some forces conducted land-attack and air warfare not seen by U.S. forces in years, while others provided desperately needed humanitarian aid. The year was also marked by a tragedy, with the Navy seeing the most non-combat deaths in decades. 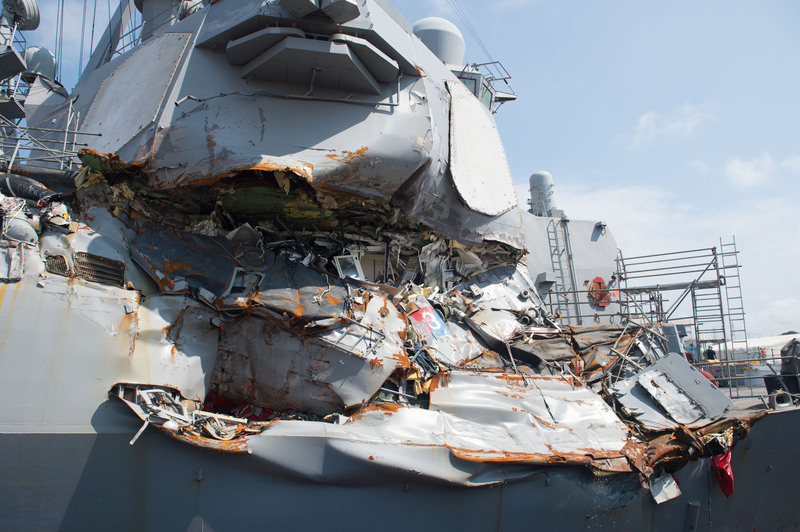 Two collisions between guided-missile destroyers and commercial vessels resulted in 17 deaths and a Navy-wide look at surface warfare operations. Combat operations in Syria escalated in two serious situations this year, highlighting the volatile and complex mix of U.S., Russian, Syrian regime, Syrian rebel and ISIS forces all operating in the same region. 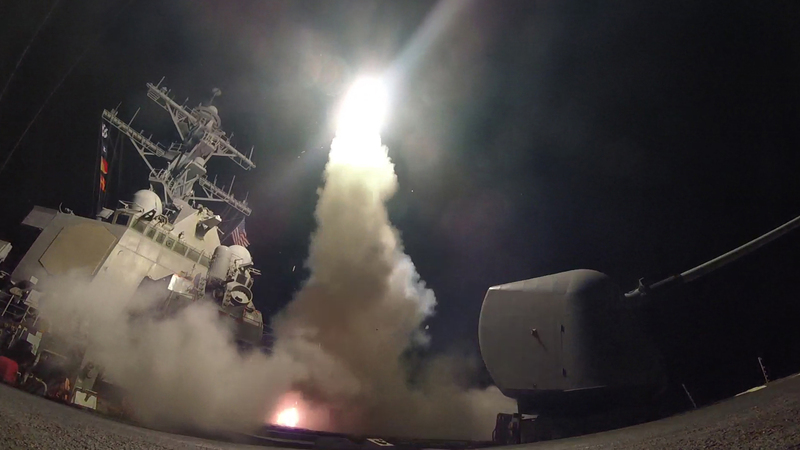 Before dawn on April 7, guided-missile destroyers USS Porter (DDG-78) and USS Ross (DDG-71) fired 59 Tomahawk Land Attack Missiles in a series of strikes on a Syrian airfield. The strike targeted al-Shayrat Airfield near Homs, where just days before Syrian regime fixed-wing planes departed to carry out a chemical weapons strike on the town of Khan Sheikhoun. Hundreds of innocent Syrian people, including women and children, were killed or injured in the chemical weapons attack, the Pentagon told reporters at the time. Though U.S. forces had followed protocol and warned Russian forces in the area of the impending Tomahawk strike, in accordance with an air space deconfliction agreement for operations in Syria, Russia suspended that agreement in the aftermath of the strike. Russia also sent a frigate and then an entire surface action group to the Mediterranean as a warning to the U.S.
An F/A-18F Super Hornet from the “Black Knights” of Strike Fighter Squadron (VFA) 154 launches from the flight deck of the aircraft carrier USS Nimitz (CVN 68) while another Super Hornet from the “Black Knights” and an EA-18G Growler from the “Gray Wolves” of Electronic Attack Squadron (VAQ) 142 prepare to launch, July 29, 2017, in the Arabian Gulf. US Navy photo. Multiple carrier strike groups and amphibious ready groups took the fight to ISIS this year, rotating in and out of U.S. 5th Fleet and 6th Fleet to conduct anti-ISIS strikes in the Middle East. In February, strike fighters from USS George H.W. Bush (CVN-77) began operations against targets in Syria, as part of the ongoing Operation Inherent Resolve. 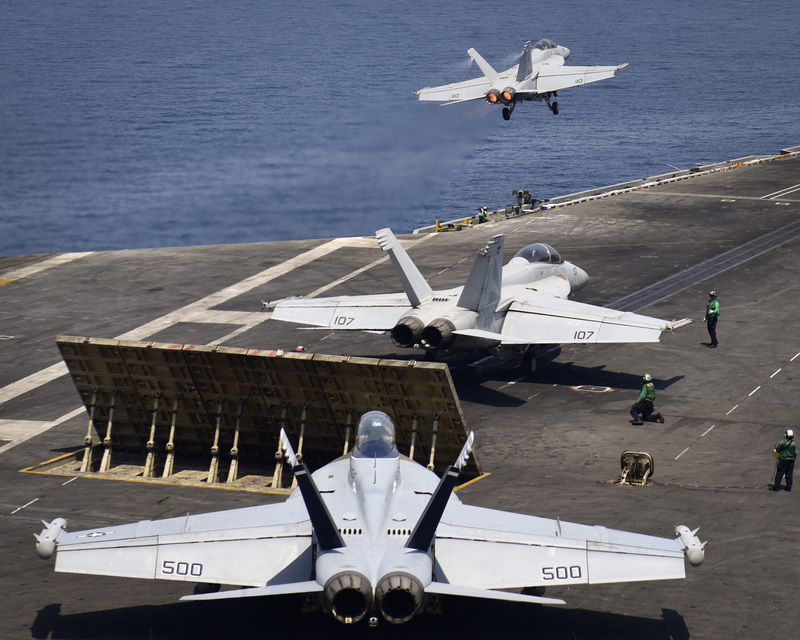 In July, fighters from Carrier Air Wing 11 launched from the deck of USS Nimitz (CVN-68) to hit ISIS positions, as the Bush CSG handed over anti-ISIS operations to the Nimitiz CSG. In early 2017, elements of Makin Island Amphibious Ready Group (ARG) and 11th Marine Expeditionary Unit (MEU) had boots on the ground, helping retake territory occupied by ISIS forces. Field artillery cannoneers deployed to northern Syria for several weeks, and in total 11th MEU spent about two months in country. 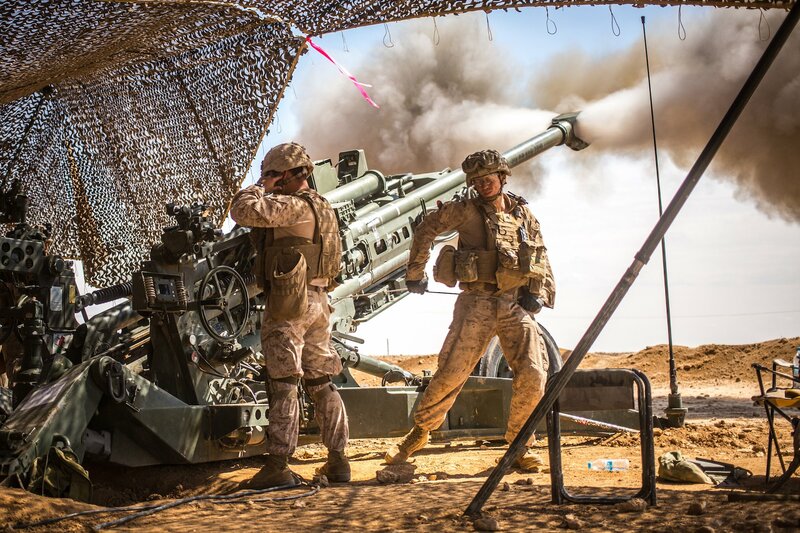 The task force executed over 400 fire missions and fired more than 4,500 rounds from M777 howitzers to support our coalition partners fighting to isolate and then liberate Raqqah from ISIS, according to a Marine Corps statement at the time. USS Mason (DDG-87), the ship that warded off multiple cruise missile attacks in 2016 to protect U.S. ships in the Red Sea, was recognized in October as the best ship in the U.S. Atlantic fleet for 2016. The Mason crew received the Battenberg Cup from Naval Surface Force Atlantic commander Rear Adm. Jesse Wilson Jr. during a ceremony on the ship. In January, guided-missile destroyer USS Mahan (DDG-72) fired three warning shots to ward off four armed Iranian Revolutionary Guard Corps Navy (IRGCN) attack boats coming at the ship at high speed. In March, an IRGCN patrol boat stopped short in front of U.S. Navy surveillance ship USNS Invincible (T-AGM-24), forcing the ship to maneuver around the patrol boat while avoiding a collision with a commercial ship that was already trying to overtake Invincible and three other coalition warships in the narrow Strait of Hormuz. 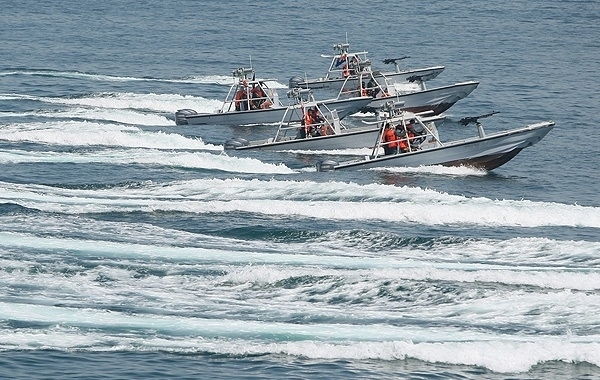 In June, an Iranian Houdong-class guided-missile boat came within 800 yards of a formation of three U.S. Navy ships transiting the Strait of Hormuz, shining a spotlight on one ship and training a laser on a CH-53E helicopter. On July 25, USS Thunderbolt (PC-12) fired “multiple warning shots” after an IRGCN Nassar-class patrol boat came within 150 yards of the American PC and within one nautical mile of nearby cruiser USS Vella Gulf (CG-72). Twice in the span of a week in August, Iranian drones approached USS Nimitz (CVN-68) while the carrier conducted air operations in international waters. On August 8, an Iranian drone harassed an F/A-18E Super Hornet assigned to Nimitz. During that incident, the drone came within 100 feet vertically and 200 feet laterally of the Super Hornet, which maneuvered to avoid colliding with the drone. Then, on August 13, an Iranian drone approached Nimitz, coming within 1,000 feet of U.S. aircraft. On February 10, USS Porter (DDG-78) was buzzed by four Russian aircraft while the guided-missile destroyer operated in international waters in the Black Sea. In one incident, a Sukhoi Su-24 Fencer fighter came within 200 yards of the ship, flying at 300 feet at more than 500 knots. Porter had just finished the 10-day Romanian-led multinational Sea Shield 2017 exercise. On November 25, a Navy P-8A Poseidon anti-submarine warfare aircraft was intercepted by a Russian Su-30 Flanker fighter jet while flying over the Black Sea. Russian media accounts claimed the Poseidon was approaching the Russian coastline at a high rate of speed. The Poseidon is a modified version of the Boeing 737-800ERX with a top airspeed of about 564 miles per hour, according to the Navy, while the Flanker can reportedly reach Mach 2. On the other end of the warfighting spectrum, an active 2017 hurricane season in the Caribbean and Gulf of Mexico saw three named hurricanes – Harvey, Irma, and Maria – strike the U.S. mainland, territories, and neighboring island nations. The Navy and Marine Corp mobilized a massive response of ships, helicopters and personnel to provide humanitarian and disaster relief, especially in the U.S. Virgin Islands and Puerto Rico – which saw its entire electrical grid taken out by the storms. 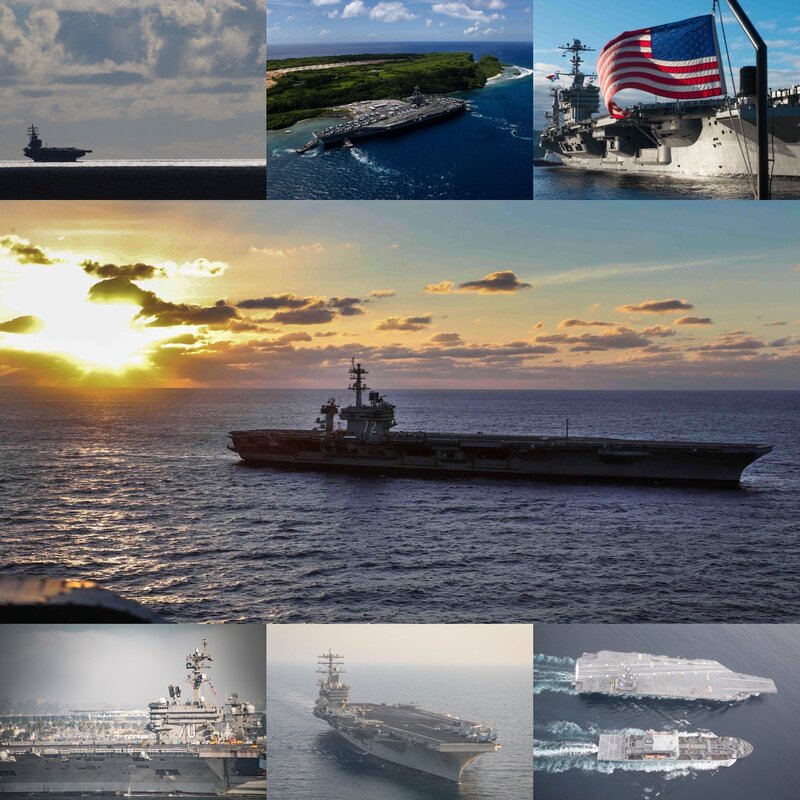 Aircraft carrier USS Abraham Lincoln (CVN-72); amphibious assault ships USS Iwo Jima (LHD-7), USS Wasp (LHD-1) and USS Kearsarge (LHD-3); amphibious transport dock ship USS New York (LPD-21); dock landing ship USS Oak Hill (LSD-51); Arleigh Burke-class destroyer USS Farragut (DDG-99); and guided-missile cruiser USS San Jacinto (CG-56) all responded to the region. The Kearsarge Amphibious Ready Group was deployed for more than two months, shouldering the bulk of relief work to the region. 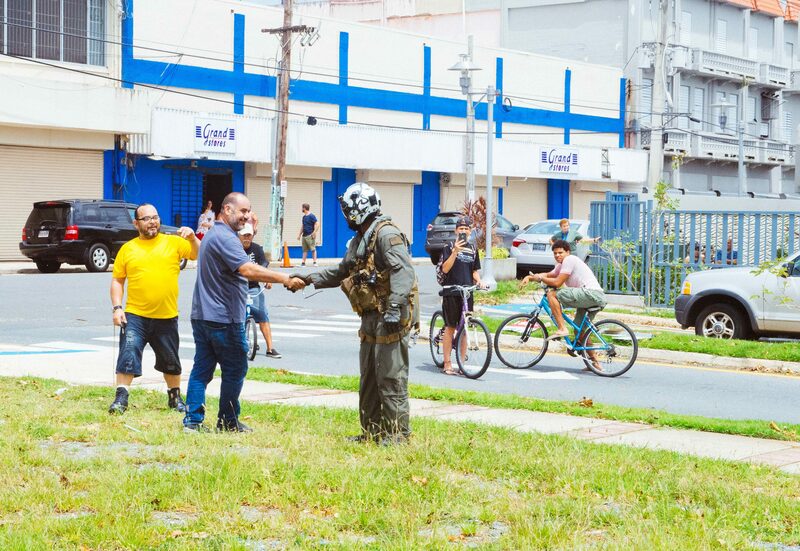 Marines from the 26th and 24th MEUs and sailors from Amphibious Construction Battalion 2 and Construction Battalion Maintenance Unit 202 cleared roads in Puerto Rico and helped restore power to hospitals. Among other contributions, the Kearsarge ARG delivered more than 3 million pounds of supplies to Puerto Rico and made 2,608 weather observations, which were used for flight operations conducted by Kearsarge and other ships in the disaster relief effort. With Puerto Rico’s hospitals relying on generator power for weeks, the Navy also sent hospital ship USNS Comfort (T-AH-20) to region. Comfort left Norfolk on Sept. 29 and arrived in Puerto Rico on Oct. 4. Immediately upon arrival, sailors from Comfort started treating patients. Ultimately, according to a Navy statement, Comfort would treat more than 1,899 patients, perform 191 surgeries, provide 76,000 liters of oxygen, and share 10 tons of food and water. 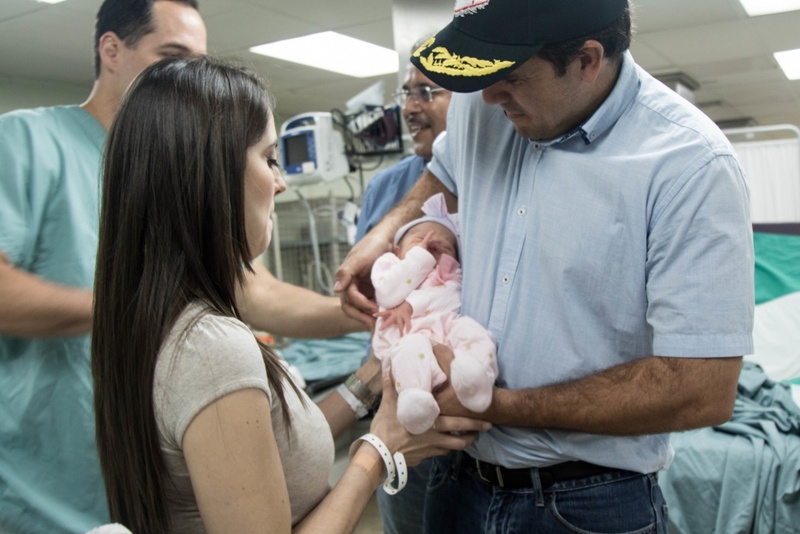 The Comfort staff also delivered two children during the hurricane relief mission. The first was a baby girl, Sara Victoria Llull Rodriguiz, born Oct. 14. The second was a baby boy, Isaias Valerio-Fonseca, born Nov. 3 to a father who is a Navy veteran, according to a Navy statement. Seven U.S. aircraft carriers are underway for the first time simultaneously in years. During early November, the Navy saw significant activity in its aircraft carrier fleet, with seven of the fleet’s 11 nuclear-powered aircraft carriers operating at the same time for the first time in several years. Also in early November, USS Ronald Reagan (CVN-76), USS Nimitz (CVN-68) and USS Theodore Roosevelt (CVN-71) operated together with their escorts and air wings off the Korean peninsula. A series four ship crashes in U.S. 7th Fleet, including two deadly collisions between guided-missile destroyers and commercial ships resulting in the deaths of 17 sailors, spurred the Navy take a hard look at its operations. Two reports, one ordered by the Chief of Naval Operations Adm. John Richardson and one ordered by Secretary of the Navy Richard V. Spencer, detailed the factors contributing to what has been among the most deadly years in decades in terms of non-combat fatalities. In January, cruiser USS Antietam (CG-54) ran aground in Tokyo Bay. No one was injured but more than a thousand gallons of hydraulic oil leaked from the ship, causing environmental concerns. The ship’s commanding officer was removed from his job following the grounding. In May, cruiser USS Lake Champlain (CG-57) collided with a Korean fishing boat that did not have radio or GPS and did not respond to audio warnings. On June 17, destroyer USS Fitzgerald (DDG-62) collided with a Philippine-flagged merchant ship, killing seven American sailors. On Aug. 21, destroyer USS John S. McCain (DDG-56) collided with a chemical tanker near Singapore, killing 10 American sailors. Top commanders from the ships and U.S. 7th Fleet were also removed from their jobs after the incidents, and the CNO ordered an operational pause to allow commanders to review safety operations with their commands. McCain is currently undergoing repairs in Japan. Fitzgerald is being transported to the U.S. for repairs. In November, USS Benfold (DDG-65) suffered minor damage during a slow-speed collision with a Japanese tug boat in Japan. This incident was determined to be the fault of the tug. While 2017 will be remembered for the spate of ship collisions and groundings, other incidents occurred during the year that illustrate the dangers sailors face every day doing their jobs. An F/A-18E Super Hornet crashed while on approach to land on aircraft carrier USS Carl Vinson (CVN-70) on April 10 near the Philippines. The pilot ditched the aircraft in the sea, safely ejected, and was recovered by a helicopter. During a training operation roughly 20 nautical miles off the Florida coast southeast of Key West, a F-5N Tiger II crashed into the Atlantic Ocean off the Florida coast on August 9. The jet was part of the Navy Reserve’s fleet adversary program that helps train naval aviators. The pilot was able to eject from the aircraft and was rescued by the Coast Guard. An F/A-18E Super Hornet pilot assigned to the USS Nimitz (CVN-68) had to make an emergency landing at the Bahrain International Airport on August 12. 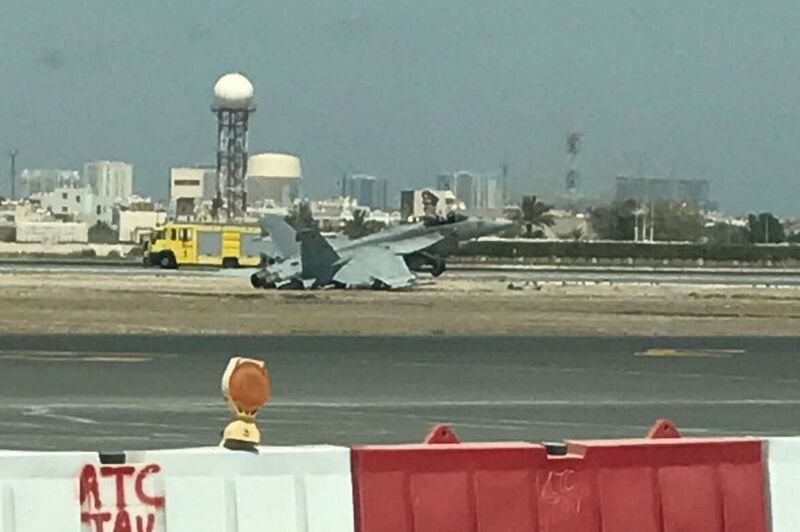 The Super Hornet launched from Nimitz, suffered a critical engine failure, and crash-landed at the airport while trying to reach a divert field at Sheik Isa Air Base, Bahrain. A sailor from cruiser USS Shiloh (CG-67) was reported missing on June 8 but found alive onboard the ship a week later. U.S. Navy and Japanese navy and coast guard assets spent 50 hours searching for the sailor. A sailor assigned to destroyer USS Stethe­m (DDG-63) was reported missing and assumed overboard on August 1. After more than three days of continuous search with U.S., Japanese and Chinese ships and aircraft, the sailor was presumed dead on August 4. 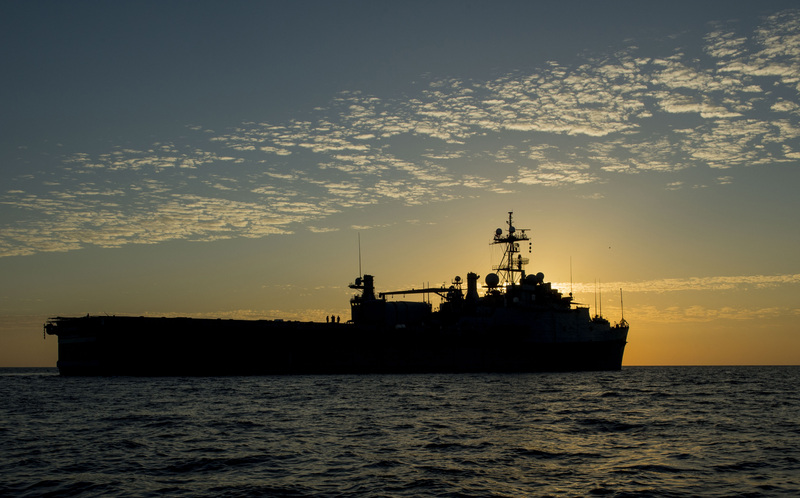 A sailor from USS Normandy (CG-60) was declared lost at sea and presumed dead after falling overboard on June 6 during training off the North Carolina coast. Navy and Coast Guard assets searched for three days. On October 1, a T-45C Goshawk trainer jet crashed near Tellico Plains, Tenn., near the Cherokee National Forest in the eastern part of the state, killing the flight instructor and student onboard. On Nov. 22, a C-2A aircraft with 11 crew and passengers onboard crashed into the Philippine Sea approximately 500 nautical miles southeast of Okinawa. Eight passengers were rescued, but three were not recovered and presumed dead. The Navy continued to discipline officers involved in the sprawling Fat Leonard bribery investigation. In 2017 alone, nine officers, including former Navy director of intelligence operations retired Rear Adm. Bruce Loveless, were arrested at their homes. The Navy held its first Article 32 hearing in the case in June, with the service charging a former fighter pilot with bribery, graft, prostitution and adultery, and accepting gifts. A former deputy commander of Military Sealift Command-Far East pled guilty to Fat Leonard-related charges in August, the Navy secretary issued the first secretarial letter of censure in the case since 2015, and an active Navy captain and former destroyer squadron commander was charged with providing information on ship movements and business competitors in exchange for gifts. Former Naval intelligence chief Vice Adm. Ted Branch was cleared in the case after more than three years of investigation. The Navy re-designated its first Expeditionary Landing Base ship a warship, converting the Military Sealift Command ship USNS Lewis B. Puller (T-ESB-3) into USS Lewis B. Puller (ESB-3) so it could better meet operational needs in the Middle East. The 220 year-old USS Constitution left dry dock in Boston in July, following a two-year restoration project. After 46 years of disaster relief, civilian evacuations, troop transports, fleet protection, the conversion from an amphibious ship to an afloat forward staging base and the first operational use of a laser weapon, USS Ponce (AFSB(I)-15) was removed from active service during a ceremony in October.